Women Beyond Borders began in a conversation at an art opening in Santa Barbara in 1991. Founder and artist, Lorraine Serena, contemplated the ease of shipping small works of art around the world with artist friend Elena Siff. Over the following year artists and art professionals came together in Lorraine’s studio to generate ideas to connect women artists and forge understanding and collaboration among women. 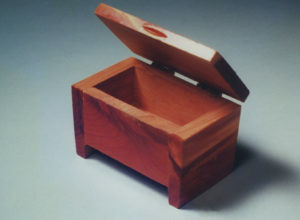 At one of the studio meetings, a vintage cedar souvenir box on the table struck a chord. “That’s it!” said Victoria Vesna, a professor at UCLA, and the “box project” began. 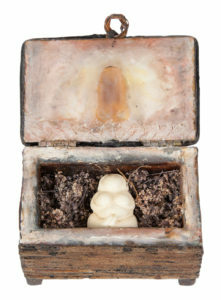 This vessel, evocative of a womb, tomb, gift, shrine… developed into a resonating symbol of woman, herself. 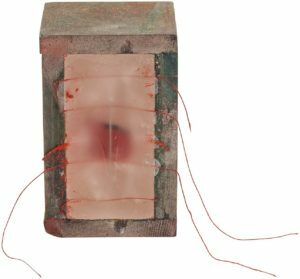 The box, about the size of a human heart, was practical to transport, intimate and yet metaphorically expansive. Several hundred boxes, each 3-1/2” x 2-1/2” x 2″, were constructed and distributed to artist friends including Isabel Barbuzza, Ciel Bergman, Sky Bergman, Rose Bilat, Beverly Decker, Elisse Pogofsky-Harris, Alice Hutchins, Evelyn Jacob, Saritha Margon, Maria Velasco, Elena Siff, Victoria Vesna, and Mary Heebner. Inspired, WBB participants swiftly began contacting artists and curators around the world who, in turn, invited up to twelve artists to participate. There was no formal process here, but rather improvisation! The selection of countries was made simply on the basis that someone in the group knew someone abroad. 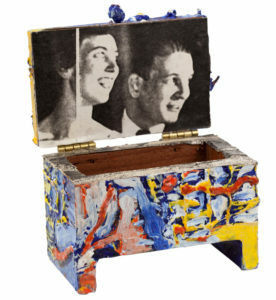 Evelyn spontaneously walked into a gallery in Paris and left boxes with a young woman who distributed them to friends. Beverly enlisted her sister-in-law in locating Native American women. Isabel enlisted the help of her 13 year-old son, Xavier, who carried boxes in his backpack to Argentina. Elena’s daughter, Ravelle, who was studying in Israel, contacted curator Daphna Naor, who scheduled an exhibition coinciding with International Women’s Day in Jerusalem. A few months later we received the first box creations. We were astonished at the range of expression the boxes evoked. It was at this moment that the collaboration took wing and dialogue was established, opening doors to new possibilities. 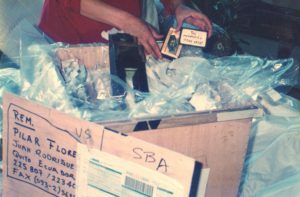 These original boxes served as a grassroots foundation which began its journey to virtually every continent in the world. A small box was given to me. I had to take a stand on what that box should mean. The more I worked on it, the more condensed the energy became. It was like atomic energy, my life condensed. When my box took its place among all the other atomic reactions of love, despair, joy, fun and fear, it was such a reaffirming commitment to living and being a women, that I felt the room explode with all the creative energy that was present. As contributing artist and team organizer of Women Beyond Borders, I learned to understand the world in a radically new way: one that is based in interaction and teamwork, versus the traditionally patriarchal view of individuality, competition and isolation. Woman is one and multiple at once; her strength resides in being so versatile to the extent that her individuality doesn’t feel threatened by working in collaboration. This attitude is very valuable and very rare nowadays. Collaboration, exchange, dialogue are the elements that contribute to the impact of a show like this. Woman extends herself and becomes “female”. Female exists beyond anatomical difference.